Learn how to make miniature dollhouse furniture, mini paper accessories and get techniques, tips and monthly tutorials. This clock is a special request. This is the picture that I copied from. This is my clock from the corner cabinet kitchen. I have pictures of that kitchen in the "Things to do, Things to see" list at the left of the blog. I made my clock from bass wood. I used the hands and pendulum from a "House of Miniatures" kit. For the "glass" for the clock I used plastic packaging from a package of ping pong balls so the glass is curved. I tried to simplify the clock so most everyone will be able to make it. If you want to make this out of wood you can. Nancy has your patterns drawn for you and they can be used for card stock or wood. Here are Nancy's patterns. Here patterns are going to make copying and cutting out so much nicer than my hand drawn pictures. Use the instructions on how to re-size the patterns from the "Things to do, Things to see" list. 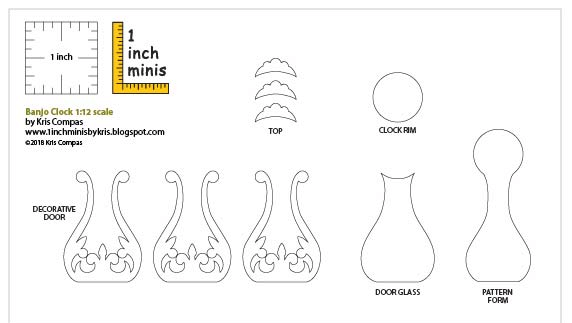 Questions about the 1 inch square that Nancy always prints on here pattern page, this is for you to use when you are sizing the patterns. When the square prints out and is measured at 1 inch, you have your patterns the right size. First of all you are going to need a form to laminate the card stock around. I used two layers of foam core for the form. Trace the pattern onto the foam core and cut out. You can use one layer of foam core for this. Cut a few strips of card stock 1/4" wide. I used yellow wood glue for most of this tutorial. I will let you know when I use tacky glue. We use yellow wood glue because it dries hard and stiff. Glue the first strip around the form, overlap the ends and glue together. Don't glue the strip to the form. Apply the glue to the first strip and glue another strip on. Smooth and hold the strips to the form. I have four strips glued together. Let this dry. I let mine dry overnight. Make a foam core form for the clock rim. I used the 11/16" circle from my circle template. Cut a couple of strips of card stock. I didn't measure, these are somewhere between an 1/8" and 1/16". I wrapped and glued four layers around the form. I know this will be tedious. Cut out 3 of the doors. I did try to put these on my digital cutter. I didn't have enough space between my leaf patterns for it to read just an outline, it read 3 patterns and wouldn't copy. Grab a pair of sharp scissors and carefully cut the doors out of card stock. Glue the three layers together. Trace around your body pattern onto card stock to make a back for the clock. Cut it out and glue it to the clock body you made. Cut a strip of mat board 13/16" wide. Cut two strips 3/8" wide. I made my bottom from wood trims that I had and combined to get this piece. You can change the shape if you want. Just giving you a few pictures of it so you can understand what we are going to do. I used red card stock so you could see the space I left around it. I am not measuring now, it's all up to your eye. Glue a piece of card stock onto each of your mat board pieces. Round off the top edge of one long side and the two short sides using sand paper. Sand both pieces of mat board. Glue the two pieces of mat board together with the card stock pieces in the center. Round off the mat board edges just like you did in the previous picture. I've cut another piece of mat board. I've rounded off the long side and two short sides. It's been glued onto one side of your bottom assembly. I haven't glued it to the clock body, yet. The piece you just glued on is the top of the assembly. We will be adding to the bottom to make the point. Cut out another piece of mat board. Round off the same edges as the last piece. Glue this onto your assembly. So far we are asymmetrical. Cut another piece of mat board for the bottom. Cut another piece of mat board. Don't round off, don't glue it on. Showing this for size, this new piece is will be a part of the next assembly in the next pictures. Count the piece you just cut, cut out a total of four mat board pieces that graduate down in size. The mat board is going to separate because it's being cut so small, just glue it back together. Glue the four pieces together and add glue to the outside like the picture. I am going to fill in and smooth out the surface with yellow wood glue. This is going to have to dry and you will add more glue to get a smooth surface to shape with sand paper. Cut out three decorative tops for the rims from card stock. Glue the top onto the clock rim. Fill in any gaps you may have with yellow wood glue. Glue the first part of the bottom assembly to the bottom of the clock body. I tear out pictures of clocks from magazines and save them. Being that my husband is a woodworker I do get the occasional catalog with clock parts. Get on Google, type clock parts or clock supplies. Woodcraft or Cherrytree are two companies you may find. Request a catalog abd you will have plenty of clock faces to use. I did not print any because I think they look best right from the glossy paper of the catalog. I found one that will fit. Use your foam core form for the base for your clock face. Use glue stick to glue the clock face to the foam core. Set this aside for now. When the glue on the bottom piece is dry sand it smooth. When you are satisfied with the shape glue the bottom to the first part of the bottom. For the little ball at the bottom I punched out a circle, dampened it and rolled it into a ball. Let this get good and dry before you glue it to the bottom. Cut out a 5/16" to 11/32" circle from a circle template. Cut out three strips of card stock somewhere between 1/8" and 1/16". Glue the circle to one end of the strip. I am using acrylic craft paint to paint my clock. I will paint on another layer and let this dry. I will very carefully sand the surfaces and paint again. I do not repaint the pendulum, the one coat of gold paint was just fine. You see I haven't glued on the ball, yet. I will do that now. After I have painted and sanded and I am satisfied with the surfaces I apply one coat of a clear coat to everything. Let this dry. I am going to cut the "glass" from clear packaging. I scratched with a "T" pin a circle for my clock face rim. I did a little fine tuning with my scissors and popped the glass into the rim. I did not use glue, the fit is tight enough for me. Use the pattern for the door glass to make a glass for the door. Cut this out and set aside for now. I've mixed a dirty wash using acrylic craft paint and water. I use an old stiff brush to apply the wash and a soft bristle brush to remove most of the wash. Here are the parts with the wash brushed off and ready for the next step. I did not apply a clear finish, you can but let this surface dry for at least a couple of hours before you apply the clear finish. I've set the door onto the body, not glued, measure for the length of the pendulum. Make a slice into the foam core for the pendulum. Cut the pendulum, slip it into the slot and test the length. Don't put the foam core all the way into the body of the clock. It is very difficult to remove without damage. When you have it right slip the foam core in, you don't have to glue it. Apply a little glue into the slot where the pendulum is. Apply tacky glue to the edge of the upper part of the body of the clock. Put your clock face rim into place. Trial fit your glass and trim if needed. When you are satisfied with the fit apply tiny bits of tacky glue to the edge of the body and put the glass into place. Apply tacky glue to the edge of the glass and put the door onto the glass. Now you have a banjo clock to hang on the wall. Have fun, Expand on it, Make it better . . .
Hi, my name is Kris and I make minis. I love to share what I make and this is where I do the sharing. I try to have a tutorial up by the 20th of every month. I make the mini accessories out of paper, mostly. If you are new to this blog be sure to search the entire blog. There is a lot to see and read about. Below this "Welcome" I have a list "Things to do, Things to see". You will find the tutorials in this list along with pictures of my room boxes. I have techniques and tips sprinkled through out the tutorials. If you would like to contact me with questions or would like to contribute a picture of a finished tutorial please use: camceiling@frontiernet.net. This is the Nancy that makes our patterns.